Men’s artistic director Kim Jones is one of the most notable names in high fashion these days and some would even argue that he is a notable name in street fashion also as the lines separating both entities seem to have blurred especially after Kim Jones whom was creative director at Louis Vuitton pushed for a collaboration with notable streetwear brand Supreme. This morning in Tokyo, Japan notable names like Pusha T, ASAP Rocky, Matthew Williams and plenty more were on hand for Kim Jones to unveil the Dior Men’s Pre-Fall collection. 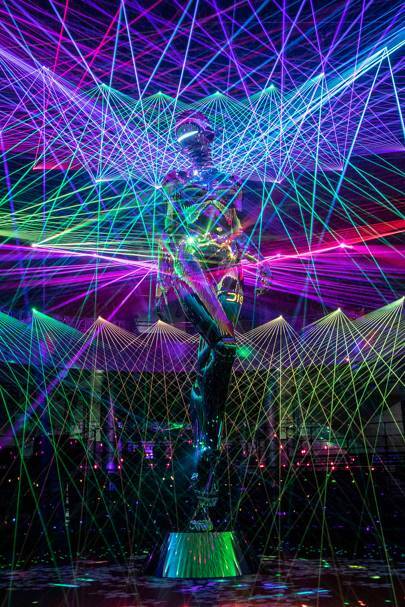 The show was themed around renowned Japanese Illustrator Hajime Sorayama provocative robot creations which developed a cult following in the 80’s. The collection featured branded logo sweatshirts, tailored slim cut trousers, grey fitting blazers, pearled jackets and various accessories featuring good friend Matthew Williams ALYX buckles. Seems that Kim Jones will continue to have large statues/figures as the centerpiece for the oval catwalk just as he did back in the spring where the theme was based around KAWS. Jones done a great job of capturing the energy of Hajime Sorayama futuristic vibe with robotic images and multi colored lasers as every piece of the collection is something that captivates that exact energy with the futuristic silhouette or reflective color hinting us to believe that the translation of creations for the future will keep Dior as a mainstay going forward with contemporary fashion. View images and the full show below.